Aerial photography in 1957 resulted in the discovery of a rectangular double-ditched enclosure overlooking the River Severn floodplain near Bewdley in Worcestershire. 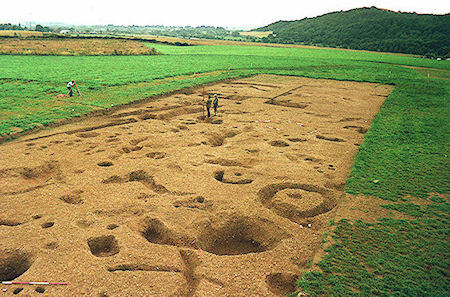 Excavation in the 1970s, in advance of gravel extraction, provided limited evidence of Mesolithic, Neolithic and Bronze Age activity prior to occupation in the later Iron Age, when the enclosure was established comprising a ditch and bank, and later a palisade and ditch, with single and double portal gateways respectively, and with buildings internally. Pottery and briquetage indicate trading links with the wider region, respectively with west and north Worcestershire, and with Droitwich. The main Iron Age occupation is dated from the 2nd into the 1st century BC. By the 3rd-4th centuries AD the site was apparently cultivated, as small quantities of Romano-British pottery were scattered across the site, probably as a result of manuring arable fields associated with a nearby, but as yet unlocated settlement. Similarly in the medieval and post-medieval periods a thin scatter of finds in the overlying soils indicated further agricultural activity.